Erosion is the removal and transportation of soil and rock by either water flow or wind. In terms of stormwater, erosion most often refers to stream bank erosion, where rapid water flows cut away at the edges and bottoms of stream banks and transport soil downstream. Stormwater runoff is a major contributor to rapid stream flows and erosion. Erosion is a natural process but is restricted in healthy ecosystems. Excess erosion can cause major problems for people and wildlife alike. When stream banks erode, the stream can actually move across the landscape (and sometimes toward your house!). 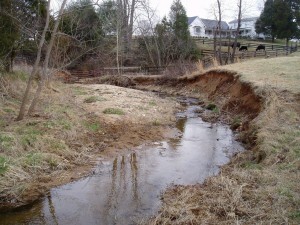 The excess sediment in the stream that is caused by erosion can suffocate fish and micro-organisms that require gravel bottom streams for feeding or reproduction. Furthermore, once the soil is washed downstream, it is gone from the property forever and can be an expensive project to stabilize impaired stream banks. Riparian buffers are crucial for slowing the erosion of stream banks. If you live adjacent to a stream or stormwater creek, consider implementing a riparian buffer on your property. If you don’t live along a stream, consider implementing BMPs that focus on retaining water on-site, which will help stabilize flows in local streams!